CIA, Mossad, and MI6, are now going from the ME, to taking over Malaysia! ...VATIC NOTE: Most of you who have been following Vatic Project during most of these overthrow of Middle East countries, know that we have proven time and again, NONE OF THE REVOLUTIONS IN THE ME were from the grassroots, rather they were CIA and Mossad instigated for several important reasons for the illums, especially the Rothschild family that needs to disappear permanently to stop all this permanently. If there is a world war, let it be the people of the globe against all Rothschild entities in banking, brokerage houses, and markets. Once purged, we can get back to normal. No more Soros' Buffets, Gates and Rockefellers. In reading this below, you will see how these CIA/MOSSAD/MI6 trained operatives/provocateurs were moved from the ME into Malaysia. 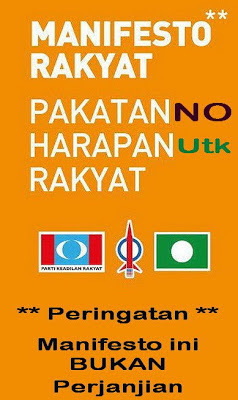 We appeal to the people of Malaysia not to succumb as the ME people did, to the deceptions and infiltrations, and lies that were used to overthrow legit muslim governments in order to control their banking practices which are in fact felony theft and fraud. We saw that in Iraq once it fell. If there is to be a world war or revolution, let it be specifically targeted against those who created this mess, THE INTERNATIONAL ZIONIST BANKERS. 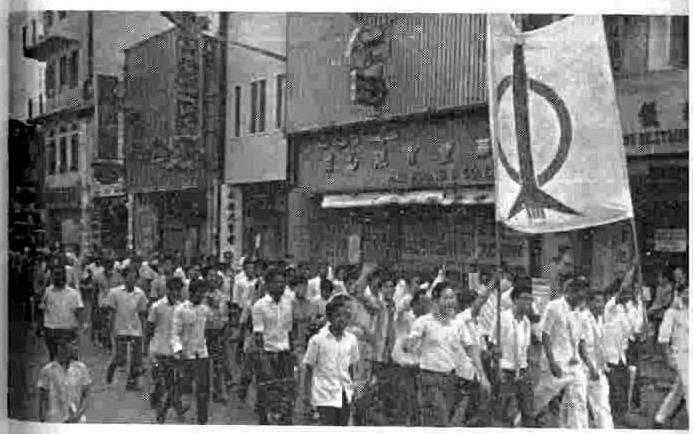 'CIA-organised gathering' in Malaysia, 28 April 2012. Malaysia is prosperous, liberal, and mainly Moslem. It has dared to criticise the USA and Israel. There is a CIA-Mossad plot to wreck Malaysia. Malaysia is not perfect, but it is 100% better than the impoverished American colony of the Philippines or the impoverished military-run Indonesia. 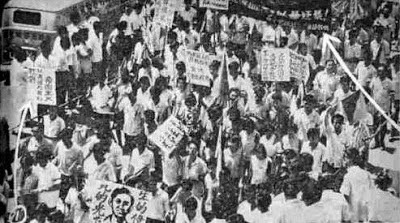 "Could street protests herald a Malaysian spring?" asks Jonah Fisher of BBC News in Kuala Lumpur. 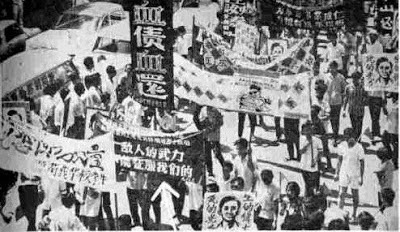 Could street protests herald a Malaysian spring? Anwar Ibrahim, the main opposition leader, who is alleged to be an asset of the CIA. It has been reported that the 'street protests' in formerly prosperous Tunisia were organised by the CIA and NATO, in order to wreck Tunisia. And we know that Tunisia's President Ben Ali was kicked out by Tunisian generals who were CIA assets. Malaysia's prime minister Najib Razak is soon to call a snap election. In a recent street CIA-organised demonstration in Kuala Lumpur, "scores of protesters were beaten by the police, and teargas and watercannon were fired at the crowd." Unfortunately, Mossad has links to the Malaysian police. 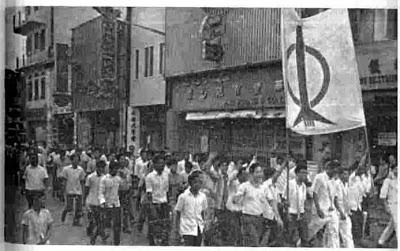 Prosperous, peaceful 'Moslem countries', like Malaysia, are not popular with the CIA and its friends. On 20 December 2011, we learnt that China and Malaysia had agreed to advance military ties. The CIA has many assets in Malaysia. In 2004, Abdel Hakim Belhaj, the Libyan with links to the CIA and al Qaeda, moved from China to Malaysia. In January 2000, al Qaeda operatives held a meeting in Kuala Lumpur in Malaysia. Former Malaysian prime minister Mahathir Mohamad has spoken out about 9 11. Malaya was a British colony. Will it become an American colony? Bicara Gades: Artikel ni diambil sepenuhnya daripada penulis blog vaticproject dan aangirfan.. tak percaya, pergi kepada link blog tersebut.. Jadi, buka lah fikiran anda yer... blogger-blogger ni bukan blogger Malaysia kot! but, there are eyes that watch us closely~ Renung-renungkanlah! 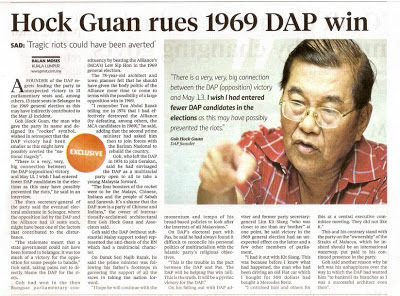 Read what Goh Hock Guan the Founder of the DAP has to say about DAP having indirectly contributed to the May 13 riots ...from the horses mouth while many has until today given a denial of their involvement, people like Kua Kia Song who even wrote a book... blaming others. The One who contributed to the riots must be the Secretary General of the DAP... Lim Kit Siang ! 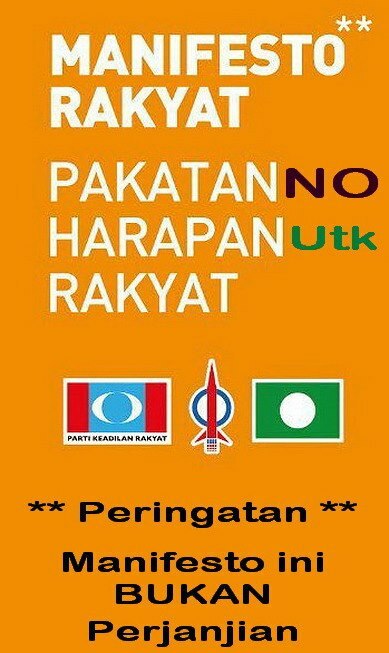 Maka, secara rasminya Manifesto Pakatan Rakyat dah keluar.. Tawaran mereka untuk rakyat? Baca boleh laa... Percaya jangan! !